Follow this page to see more updates about our FTC Robotics Forum! We'd like to send an invitation to everyone viewing this post to attend the forum that Overcharged and RevAmped are hosting! Alongside us, we have several veteran FTC teams co-hosting with us, some of whom are world class teams including Bytes of KitKats, Trial N' Terror (TNT), Tobor Tech, and Gifted Gears. At this forum, our main goal is to inform the direct community about FIRST and provide some in-depth tutorials on some concepts that are utilized in FTC. Some of these concepts include team structure, building, programming, 3D printing, CAD, sensors, and plenty more. 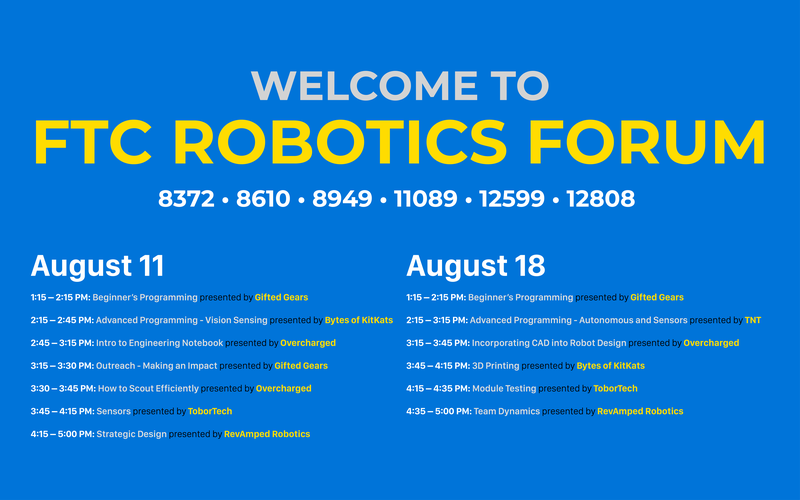 We are opening the Forum for anyone that is interested to come by, whether you're a rookie FTC team, veteran FTC member, or anyone from the general community. Our outreach is located at OHSU in Downtown Portland. We plan on having two days where the forum will take place: August 11th and August 18th of 2018. We will have a comprehensive event schedule within the coming weeks. Feel free to check back on our website to see more updates regarding the Forum! NOTE: If you plan on following along with the Programming sessions, please bring your laptop with Android Studio and the FTC SDKs installed. NOTE: In the following map, building "AUD" is where the Forum will be held. You may park at spot 10 in the map. Beginner's Programming teaches students about Android Studio Java Programming, including how to set up FTC SDKs, simple Java functions, and how to interact with robot controlling phones. Advanced Programming gives insight on Vuforia and OpenCV, two methods to carry out with vision tracking during the FTC challenges. There will be an overview regarding the two methods alongside the specifics of the both of them. Intro to Engineering Notebook provides the fundamentals of writing an award-winning engineering notebook. This presentation also covers various methods to manage the engineering notebook. Outreach: Making an Impact covers how to connect with the local community and industry professionals. It also discusses ways to measure the impacts of outreaches. How to Scout Efficiently goes over various scouting methods that have been successful in the past alongside ways to effectively market yourself to other teams. Sensors is about the various sensors in FTC and how to use them for different challenges. Strategic Design discusses tips and tricks for methods to design your robot while covering case studies of past teams. Advanced Programming discusses the uses of sensors in Autonomous programming. It goes in-depth on the coding behind each sensor module and how they work together to make a coherent Autonomous program. Incorporating CAD into Robot Design talks about the importance of CAD in the design process and how to apply it to enhance the design process of any robot. 3D Printing covers the basic anatomy of a 3D Printer and goes through a process of deciding what parts should be 3D Printed and how. Module testing explains the method to improve the incorporation of software and hardware to speed up the robot development cycle. The talk will use tune-up program developed by ToborTech to demo how the module test was done in the past season. Team Dynamics goes over the team dynamic of RevAmped Robotics and team processes that could potentially make an FTC team successful. We hope to see you at the Forum!